Things are really starting to heat up here in Texas. Temps are running in the mid-nineties, but it feels like more triple digits. The attitude “Oh, I’ll take 95° with 80% humidity any day over these ice storms” from this past winter is long gone. It’s hot, like you are sitting inside with the AC on full blast and still sweating, kind of hot. I think it’s been tougher to adjust this year because it’s like we went from winter, to nothing but rain, then straight to just plain hot. There wasn’t a really good adjustment period to the mounting heat and humidity. 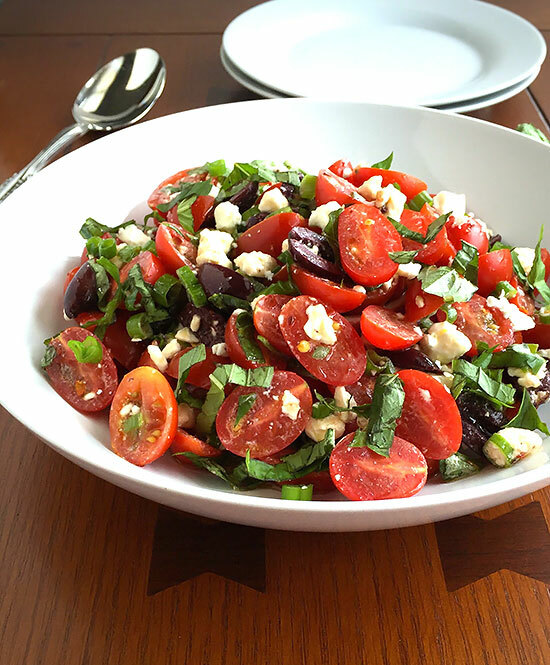 That’s why I’m thankful for easy, no-cook side dishes like this Tomato Olive Feta Salad. And Summer, when tomatoes and fresh basil are at their best, is the prime time to make this. 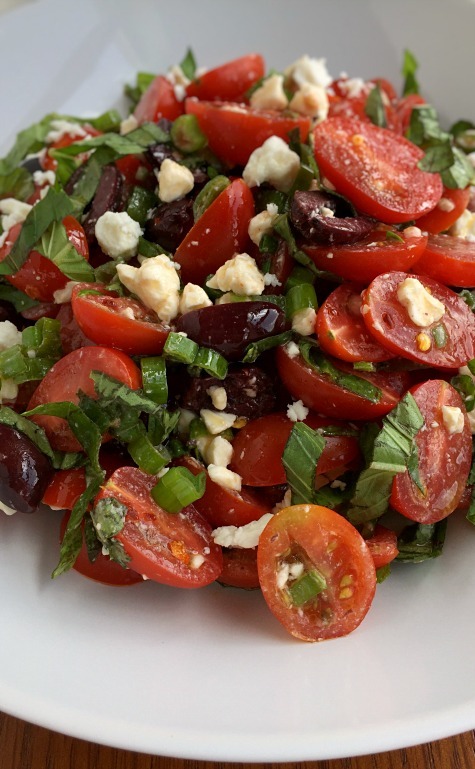 Perfectly ripe and sweet grape or cherry tomatoes are what you want for this salad. 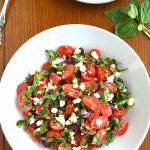 I love the combination of the sweet tomatoes, salty feta and tangy kalamata olives together. 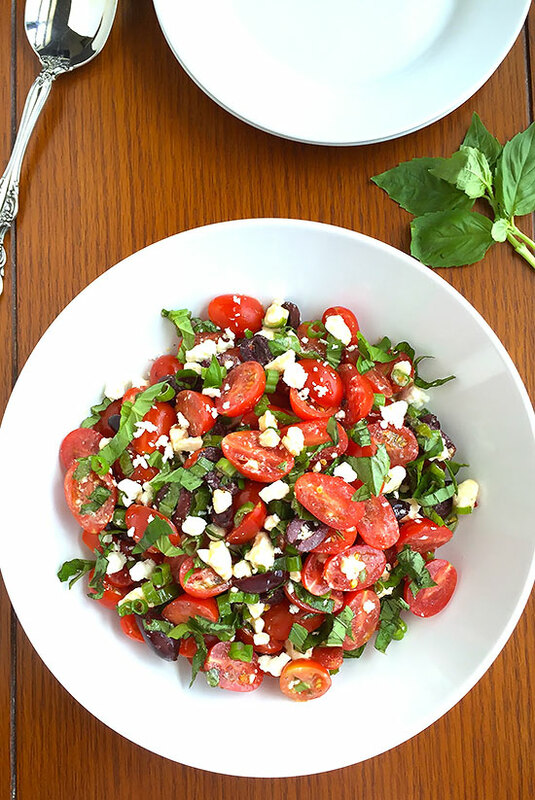 The addition of fresh basil adds delicious flavor and a nice contrast of color to the rest of the salad. Here’s a good tutorial on how to chiffonade fresh basil in case you aren’t familiar with the technique. Place the first six ingredients into a large bowl. Drizzle with the olive oil and gently toss to combine. Cover and let stand for 1 hour at room temperature before serving. Check seasonings and adjust if necessary. By Tempie at June 15, 2017 .